Fazale Omar foundation was established in memory of Hadrat Fadle Umar, Khalifatul Masih II. The funds collected under this scheme were used further the activities of special interest to Hazrat Khalifatul Masih II, in the fields of research work, education, missionary work, and economic welfare of the Jama`at. Hazrat Khalifatul Masih III announced this scheme soon after completion of his tour to seven African countries. The scheme was named after Hazrat Ummul Mu`mineen, Sayyidah Nusrat Jehan, the wife of the Promised Messiah. The funds collected under this scheme were used to organize a large number teachers and medical personnel, and set up, and maintenance of 17 medical centres and 15 schools in West Africa, purely for the service of humanity and without any profit motive. This scheme was announced by Hazrat Khalifatul Masih III, on the last day of Jalsa Salana 1973 to prepare for the celebration of 100 years of Jama`at on March 23, 1989 and to also plan an intensive program to be undertaken during the next century for spreading of Islam. By the Grace of Allah Jama`ats from more than 54 countries participated in this grand scheme, resulting in construction of mosques in Switzerland, Norway, five new centres in UK among other projects. On 26th September 1909, before the birth of Hazrat Mirza Nasir Ahmad, Hazrat Mirza Bashiruddin Mahmood Ahmad, Hazrat Khalifatul Masih II, wrote to a friend that God had informed him that He would give him a son who would strengthen the fabric of Islam. Allah fulfilled this prophecy on November 16, 1909, the promised son was named Mirza Nasir Ahmad, who later became the third Khalifa of Ahmadiyyat. He committed the Holy Quran to memory by the age 13. In 1929 he obtained his degree of Maulvi Faadil (Religious Scholar), from Punjab University. In 1934 he graduated from Government College, Lahore and then he completed his Masters from Oxford University in 1938. His various services include serving as a Professor and then the Principal of Jami`ah Ahmadiyya Qadian and then Principal of Talimul islam College. He also served as the Sadar Majlis Khuddamul Ahmadiyya, and later Sadar Majlis Ansarullah and then Sadr of Anjuman Ahmadiyya. On May 21, 1982 Hazrat Khalifatul Masih III delivered his last Friday sermon. On May 23 he left for Islamabad, where on May 26 he was taken ill and passed away on June 9, 1982. 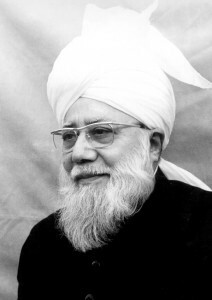 During the seventeen years of his Khilafat, Hazrat Khalifatul Masih III, with his unique administrative ability and his distinctive plans of far-reaching benefits, including his moto of Ahmadiyya Jama`at, he announced during the inauguration of Masjid Basharat, Spain, “Love for all, Hatred for none”.